Paige Skarratts completed a six-week course of radiation, defying expectations of doctors who told her parents she only days to live in September 2017. IT was the moment they farewelled their superhero. 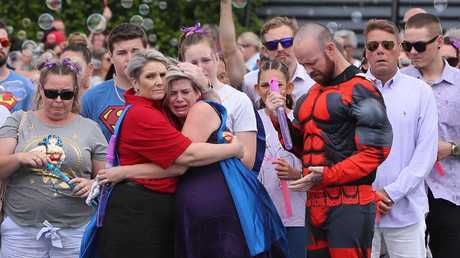 More than a hundred people wore purple, bright colours and superhero outfits in a tribute to Paige Skarratts at a celebration of her short life in Carrara yesterday. 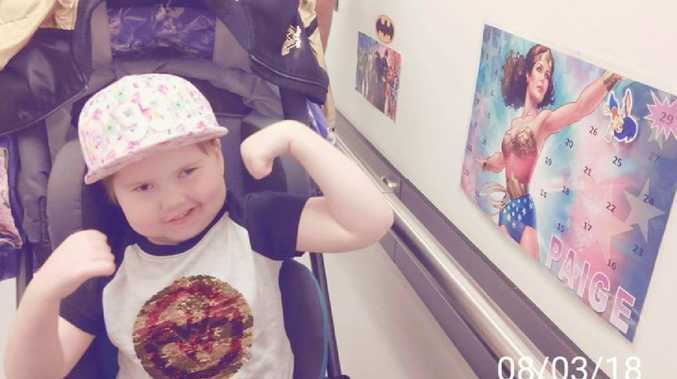 Paige died aged five last week after being diagnosed with brain cancer more than a year ago. Her parents fulfilled her dream of becoming a flower girl at their wedding when the family was told she had days to live in October last year. Family and friends at the funeral for little Paige Skarratts, who touched the hearts of the Gold Coast, at Dream Centre Carrara. Picture Glenn Hampson. But Paige defied doctors expectations and was well enough leave Brisbane's Lady Cilento Children's Hospital and return to her family's Pimpama home just five weeks later. The little girl who loved Wonder Woman, Lachy the Purple Wiggle and the Frozen movie then completed a six-week course of radiation. In September this year she watched as her parents, Jake and Tania, renewed their vows. Yesterday Jake trembled as he paid tribute his little girl in her Wonder Woman casket. "I never knew true love until you came into my life," he said. Family and friends at the funeral for little Paige Skarratts. Picture Glenn Hampson. "You showed me love, strength, compassion. Caring for others whether they hurt you or where the ones who were hurt. "Rest in peace baby girl, I love you to the moon and back, I'm so sorry." Tania said her little girl would be with her forever. "Through your biggest battle you show true strength and courage, the ability to laugh and smile when you were in pain or tired," she said. "I hope you know how proud I am of you baby girl. "Even though a part of my heart went with you the day you put your cape on, I will trust from now you will guide me through. I love you, I always have and I always will." A letter from hospital staff described Paige as a real life super hero "strong, bubbly and resilient". "Paige had a special attitude, fierce determination to prove us all wrong, wisdom and bravery beyond her years and an ability to defy the odds," said a letter read to the crowd. "With her cheeky sense of humour she effortlessly engaged with all of her hospital team. 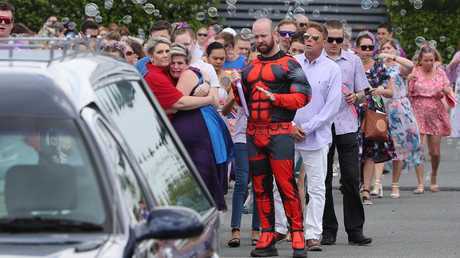 Supporters formed a guard of honour as Paige was taken from the Dream Centre and sent countless bubbles over her hearse as tears rolled down cheeks.